Urgent bulletin concerning the Company's OPTYM system and seniority. NEW: The Healthy Hound Program begins January 1, 2018 and runs through September 30, 2018! Since the program begins with the calendar year, you have nine months to complete a Health Activity - so start TODAY! The Healthy Hound Program promotes healthier lifestyles for Greyhound workers and their enrolled spouses to counteract the stress and health conditions that afflict us. Actions you take today affect you health - and your walled - tomorrow. 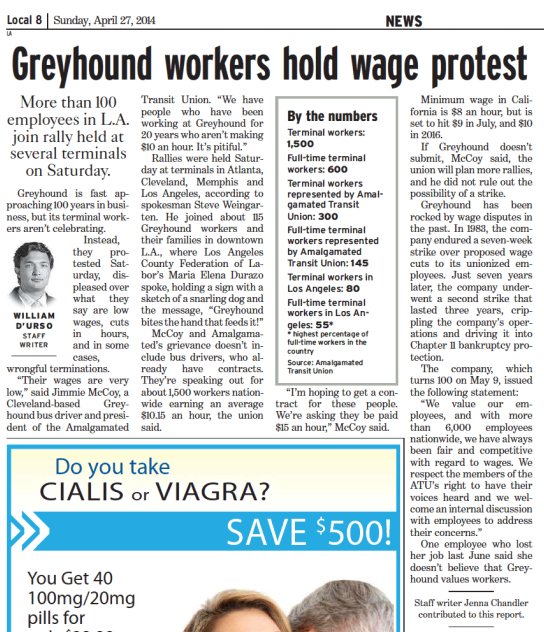 Hodgson v. Greyhound Lines, Inc.
Employment Discrimination -- Age Discrimination in the Employment Act of 1967 Bona Fide Occupational Qualification - Hodges v. Greyhound Lines, Inc.
LOS ANGELES REGISTER - More than 100 Employees in L.A. join rally held at several terminals on Saturday.